Attention 6th & 7th grade students and parents! We want to make sure you are aware of the current Horry County Schools Secondary Program opportunities offered. These are programs that interested students need to apply for in their 8th grade year and if accepted will attend starting in 9th grade. This is important information to know in 6th and 7th grade since some of the programs are very competitive and require superior grades and students to have taken Algebra 1 Honors or English 1 Honors in middle school. Some of the programs you may have heard about are Early College High School, Scholars Academy, and STEM (Academy of AAST and CHS). Eighth grade will be here before you know it and in preparation for high school it is important to find out if any of these programs are an option for your child and if any are a good fit for your child’s future goals. Click the link below to access the HCS Secondary Programs page for more information about the programs. Please be aware that this information and dates are in the process of being updated on the page. ECHS-Early College High School will offer admissions to approximately 100 students, SA-Scholars Academy will offer admissions to approximately 50 students, and STEM at AAST-Science, Technology, Engineering, and Mathematics will offer admissions to approximately 120 students. There is no maximum number of students that will be accepted into the IB programs. Students may apply for the IB program in grades 8 – 10, provided they have had the appropriate coursework. Students may only enter ECHS, SA, and STEM as rising 9th graders. Students may only enter the majors programs at ATA and AAST as rising 11th graders (apply in 10th grade). ​8th Grade Students & Parents! You are encouraged to attend an informational meeting for the HCS Secondary Programs. The programs include but are not limited to Early College High School, Scholars Academy, and STEM (AAST and CHS). In preparation for high school it is important to find out if any of these programs are an option for your child and if any are a good fit for your child’s future goals. This year, our regional meeting will be at Aynor High School on November 15, 2016 at 6pm in the AHS Auditorium. The meeting will last about an hour and a half and will cover all the programs. The meeting will be repeated at the following locations and dates. Click here to access the HCS Secondary Programs page for more information about the programs. Please be aware that this information and dates are in the process of being updated on the page. On December 1, 2016 program applications will be available on the HCSD website and on the individual program’s website. All interested students must complete the application and is due Friday, February 03, 2017. The application portal will be shut off at 12am. HCSD will evaluate each applicant based on aptitude (test scores such as MAP and PASS), previous coursework (Grades), and interest. Interest will be determined by a screening process, which may include a written essay, a computerized survey, or an interview, that is conducted at the child’s school. Beginning on February 27, 2017 students will be notified of their acceptance into programs. Each student will receive a commitment form, which must be returned to the school, guaranteeing his/her participation in the program. All acceptance/commitment forms must be returned to the school by March 22, 2017 to guarantee a space in the program. There will not be a waiting list for ECHS or SA regardless of the number of commitment forms that are received for each program. STEM will have a waiting list that will expire on June 1st. Students are strongly encouraged to consider all options prior to completing the application process and making a commitment. Click here to access the HCS Secondary Programs page for more information. This information is in the process of being updated. The Children’s Museum of South Carolina would like to recognize three local students who are “Super Heroes” in their schools and communities. Below please find the link to the student nomination form. The deadline for nominations is September 12. The Super Heroes Sunday event will take place on Sunday, September 25 at the Children’s Museum of South Carolina which is located at 2204 N. Oak Street in Myrtle Beach. ​We wanted to make you aware of an award program recognized by NASSP (National Association of Secondary School Principals) that is open to students in grades 5 -12. The program is the Prudential Spirit of Community Award. The Prudential Spirit of Community Award recognizes students who have distinguished themselves through community service. Students who have volunteered and participated in community service activities over the past year are encouraged to apply. Continue reading for more information. 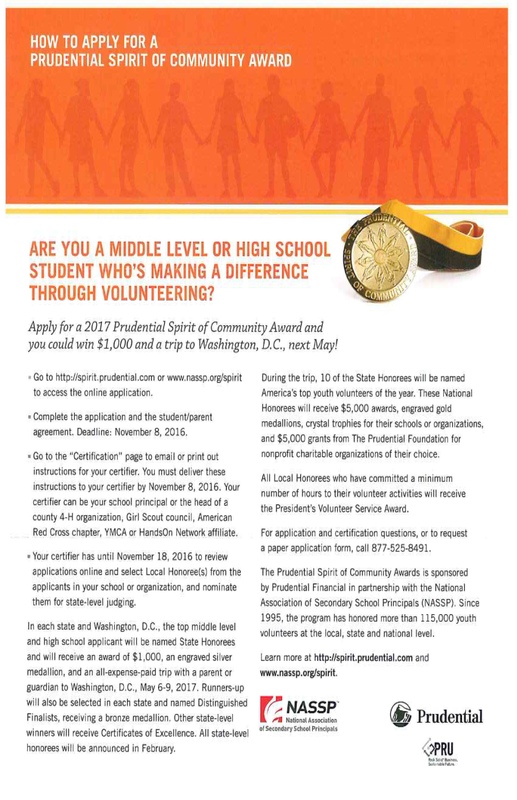 Students, if you've made a difference by volunteering in your community over the past year, you could win $1,000 and a trip to Washington, D.C., by applying for a Prudential Spirit of Community Award. Deadline to apply is November 8th. Young volunteers in grades 5-12 can complete applications online at: http://spirit.prudential.com by November 8, 2016, and then submit them to their school principals or guidance office. Applicants and their parents also must complete the application form’s signature page. See attachment/brochure below for more details on the program. Remember: If you apply, a copy of your application must be submitted to the guidance department so that it can be reviewed by the principal. AMS National Junior Honor Society is taking applications for the 2016-2017 schools year! Please keep reading below for what exactly NJHS is! This week our students are learning about STRESS and positive ways to cope with it--especially with all the end of the year testing! National Junior Honor Society made a great video where they interviewed their peers and faculty members on what stresses them out. Check it out below! ​It is time to plan for A Day Of Hope 2016. A Day of Hope is for Children in Need in Horry County in our public schools (all grades). Children will have access to such things as free dental exams, haircuts, vision exams, etc. There will also be fun things to do like basketball and other games. We wanted to send you a message about The Governor’s School for Science and Mathematics (GSSM) four-day summer day camp iTEAMS XTREME. 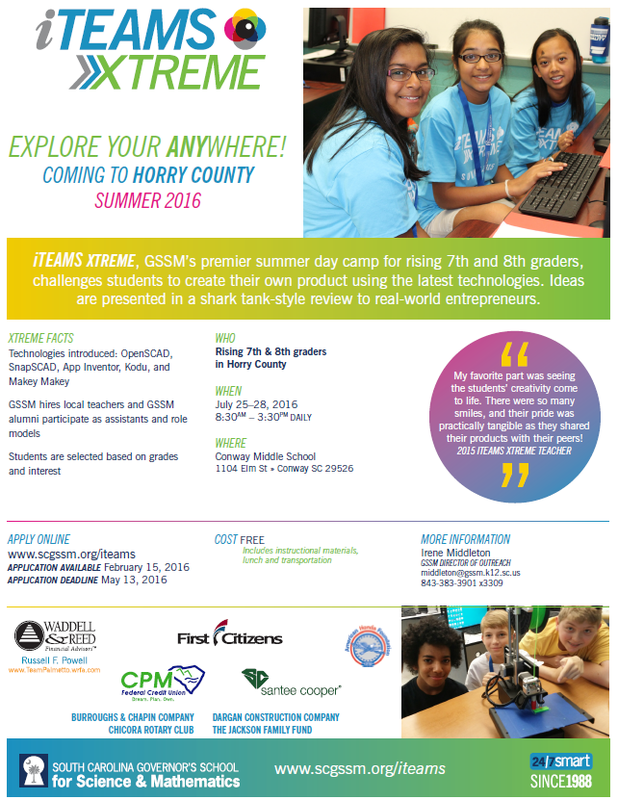 This program will be located at Conway Middle School July 25-28, 2016 and is for rising 7th & 8th graders interested in computer science, technology and entrepreneurship. Campers explore the latest technologies while engaging their innovative side to develop an idea for a new product. Challenges focus on 3-D printing, mobile app development, and creating interactive objects using MaKey MaKey. The program is free and transportation and lunch will be provided to participants. Interested students should have at least a “B” average in science and mathematics classes to apply. Follow the link below for more information on the program and how to apply. The closing date for applying to attend the camp will be May 13, 2016.